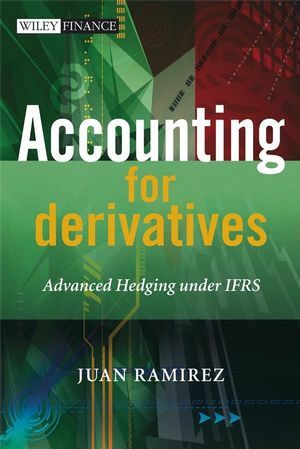 Accounting for Derivatives: Advanced Hedging under IFRS is a comprehensive practical guide to hedge accounting. This book is neither written by auditors afraid of providing opinions on strategies for which accounting rules are not clear, nor by accounting professors lacking practical experience. Instead, it is based on day-to-day experience, advising corporate CFOs and treasurers on sophisticated hedging strategies. It covers the most frequent hedging strategies and addresses the most pressing challenges that corporate executives find today. The book is case-driven with each case analysing in detail a real-life hedging strategy. A broad range of hedging strategies have been included, some of them using sophisticated derivatives. The objective of this book is to provide a conceptual framework based on the extensive use of cases so that readers can create their own accounting interpretation of the hedging strategy being considered. Accounting for Derivatives will be essential reading for CFOs, internal auditors and treasurers of corporations, professional accountants as well as derivatives professionals working at commercial and investment banks. Covers hedging instruments such as forwards, swaps, cross-currency swaps, and combinations of standard options as well as more complex derivatives such as knock-in forwards, KIKO forwards, range accruals and swaps in arrears. Juan Ramirez currently works at BNP Paribas in London and is responsible for the marketing of strategic equity derivatives to the Iberian corporate and institutional clients. After earning a bachelor degree in electrical engineering at the ICAI university in Madrid, he joined the consumer products group at Arthur Andersen where he spent five years gaining a substantial exposure to the accounting world. After earning an MBA degree from University of Chicago, Mr. Ramirez moved to London to work at Chase Manhattan (currently JP Morgan). He has also worked at Lehman Brothers, Barclays Capital and Banco Santander. Mr. Ramirez has devoted more than 15 years marketing structured derivatives solutions, being involved in commodity, credit, equity, fixed income and foreign exchange derivatives. He witnessed how the first time adoption of IFRS in 2005, greatly changed the way European entities made their hedging decisions using derivatives. Since then he has spent a substantial amount of his time helping entities to minimise the accounting impact of highly structured derivatives transactions. Mr. Ramirez is married and has three children. 1.0.1 EU’s IAS 39 versus IASB’s IAS 39. 1.0.2 US Gaap FAS 133. 1.1 Accounting Categories for Financial Assets and Liabilities. 1.1.4 The Fair Value Option. 1.2 The Amortised Cost Calculation: The Effective Interest Rate. 1.2.1 Example of Effective Interest Rate Calculation. 1.3 Hedge Accounting – Recognising Derivative Instruments. 1.4 Hedging Relationship Termination Events. 1.9 Methods for Testing Effectiveness. 1.9.1 The Critical Terms Method. 1.9.2 The Ratio Analysis or Dollar-Offset Method. 1.9.3 The regression Analysis Method. 1.9.4 The Scenario Analysis Method. 1.9.5 The Volatility Risk Reduction Method (VRR). 1.9.6 The Short-Cut Method for Interest Rates. 1.10 The Hypothetical Derivative Simplification. 1.11 Effects of Derivatives in the P&L Statement. 2. An Introduction to the Derivative Instruments. 2.1.2 IAS 39 Accounting Implications. 2.2.2 IAS 39 Accounting Implications. 2.3.2 IAS 39 Accounting Implications. 2.4.2 Standard Foreign Exchange Options. 2.4.3 Interest Rate Options – Caps, Floors and Collars. 2.4.4 IAS 39 Accounting Implications of Options – Intrinsic Versus Time Value. 2.4.5 IAS 39 Accounting Implications of Options – Written Options. 2.6.1 Knock-Out Barrier Options – Product Description. 2.6.2 Knock-In Barrier Options – Product Description. 3. Hedging Foreign Exchange Risk. 3.1 Types of Foreign Exchange Exposures. 3.3 Summary of IAS 21 Translation Rates. 3.3.1 Monetary Versus Non-Monetary Items. 3.4.1 Summary of Most Popular Hedging Derivatives – Foreign Exchange Risk. Case 3.1 Hedging a Highly Expected Foreign Sale with a Forward. Case 3.2 Hedging a Highly Expected Foreign Sale with a Tunnel. Case 3.3 Hedging a Highly Expected Foreign Sale with a Participating Forward. Case 3.4 Hedging a Highly Expected Foreign Sale with a Knock-In Forward. Case 3.5 Hedging a Highly Expected Foreign Sale with a KIKO Forward. Case 3.6 Hedging a Highly Expected Foreign Sale with a Range Accrual Forward. Case 3.7 The Treasury Centre Challenge. Case 3.8 Hedging Forecast Intragroup Transactions. 4.1 Stand-Alone Versus Consolidated Financial Statements. 4.2.1 Basic Procedures before Translation. 4.3 The Translation Differences Account. 4.4 Special Items that are Part of the Net Investment. 4.4.1 Goodwill and fair Value Adjustments. 4.5 Effect of Minority Interests on Translation Differences. 4.6 Hedging Net Investments in Foreign Operations. 4.6.1 Net Investment Hedge Issuing Foreign Currency Debt. 4.6.2 Net Investment Hedge Using Derivatives. Case 4.1 Hedging Intragroup Foreign Dividends. Case 4.2 Hedging Foreign Subsidiary Earnings. Case 4.3 Accounting for Net Investments in Foreign Operations. Case 4.4 Net Investment Hedge using a Forward. Case 4.5 Net Investment Hedge using a Cross-Currency Swap. Case 4.6 Net Investment Hedge using Foreign Currency Debt. Case 4.7 Hedging of an Investment in a Foreign Operation. 5. Hedging Interest Rate Risk. 5.1 Common Interest Rate Hedging Strategies. 5.2 Separation of Embedded Derivatives in Structured Bonds..
5.3.1 Hedging a Debt Instrument in its Entirety. 5.3.2 Hedging Only the Euribor Part of the Debt Instrument. 5.6 The Fixed-Back-to-Fixed Hedging Problem. 5.7 Interest Rate Risk Macrohedging. 5.7.2 Asset and Liability management. 5.8 Inflation-Linked Bonds and Swaps. 5.11 Summary of Most Popular Hedging Derivatives – Interest Rate Risk. Case 5.1 Hedging a Floating-Rate Liability using an Interest Rate Swap. Case 5.2 Hedging a Floating-Rate Liability using a Zero-Cost Collar. Case 5.3 Calculations and Implications of Interest Accruals. Case 5.4 Hedging a Fixed-Rate Liability with an Interest Rate Swap. Case 5.5 Hedging a Future Fixed-Rate Bond Issuance with a Swap. Case 5.6 Hedging a Future Floating-Rate Bond Issuance with a Swap. Case 5.7 Hedging a Fixed-Rate Liability with a Swap In-Arrears. Case 5.8 Hedging a Floating-Rate Liability with a European KIKO Collar. 6. Hedging Foreign Currency Liabilities. Case 6.1 Hedging a Floating-Rate Foreign Currency Liability using a Receive-Floating Pay-Floating Cross-Currency Swap. Case 6.2 Hedging a Fixed-Rate Foreign Currency Liability using a Receive-Fixed. Case 6.3 Hedging a Fixed-Rate Currency Liability using a Receive-Fixed Pay-Floating. Case 6.4 Hedging a Floating-Rate Foreign Currency Liability using a Receive-Floating. 7.1 Recognition of Equity Investments in Other Companies. 7.1.1 Impairment of Equity Investments. 7.2 Debt versus Equity Classification of Own Instruments. 7.2.1 Recognition as a Liability. 7.3 Hybrid Securities – Preference Shares. 7.4 Hybrid Securities – Convertible Bonds. 7.4.1 Convertible Bonds Denominated in the Entity’s Functional Currency. 7.4.2 Convertible Bonds Denominated in Foreign Currency. 7.5 Derivatives on Own Equity Instruments. Case 7.1 Accounting for a Stock Lending Transaction. Case 7.2 Measurement of a Mandatory Convertible Bond. Case 7.3 Measurement of a Convertible Bond. Case 7.4 Hedging Step-Up Perpetual Callable Preference Shares. Case 7.5 Base Instruments Linked to Debt Instruments. Case 7.6 Hedging an Available-for-Sale Investment with a Put Option. Case 7.7 Parking Shares through a Total Return Swap. Case 7.8 Hedging an Equity-Settled Options Plan with an Equity Swap. 8.1 Own-Use versus IAS 39 Commodity Contracts. Case 8.1 Hedging a Commodity Firm Commitment with a Forward. Case 8.2 Hedging a Commodity Inventory with Futures. Case 8.3 Hedging a Highly Expected Purchase with Futures. 9. Hedge Accounting: A Double Edged Sword. 9.1 Positive Influence on the Profit and Loss Statement. 9.3 Limited Access to Hedging Alternatives. 9.4 Risk of Reassessment of Highly Probable Transactions. 9.6 Low Compatibility with Portfolio Hedging. 9.7 Limited Solutions to Basis Risk.